WB is an application for AutoCAD 2013-2018. It serves to identify wooden rectangular beams from 3D AUTOCAD, DWG or DXF drawings. Beams can be cut perpendicularly or nonperpendicularly to the ends. 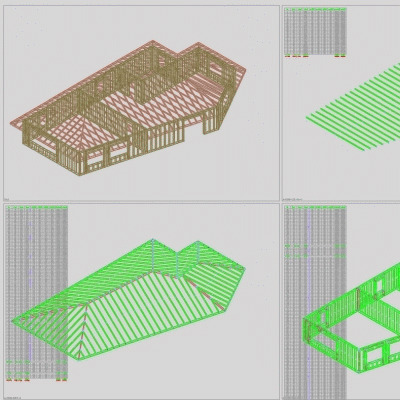 DWG or DXF files can be created directly in AutoCAD, or they can come from programs that can generate wood structures or from other materials (such as the software: ArchiCAD, Chief Architect, Autodesk Inventor, Solidworks, Tekla, FURNIT, etc.). In fact, all parts with a rectangular section of a 3D model of a building are identified. The result of the program is a drawing with the identified parts (numbered, dimensioned and positioned from an origin) and a file of quantities that can be loaded into EXCEL. It is a very useful tool for designers of structures of wooden, concrete and metal, that prepare the drawings resulting from specialized programs, for printing and establishing the lists of quantities. GWB works very well in combination with furniture design programs, like our FURNIT-Design of furniture software! It indicates the position of the beams from an origin and has an interface with FURNIT software.